With a new breakfast section in my upcoming Sweet and Skinny cookbook, I've been thinking lately about ways to make breakfast fun and good for you! One of my favorite recipes is for these simple do it yourself granola bars. I love them because you can add whatever ingredients you want. Personally I like to make mine with flaxseeds (for a dose of Omega 3 fatty acids) or with puffed quinoa cereal (for extra protein). Usually I also add some goji berries or dried apricots for something sweet. Depending on my mood I also sometimes add some dried pineapple (for a dose of vitamin C and Bromelain). 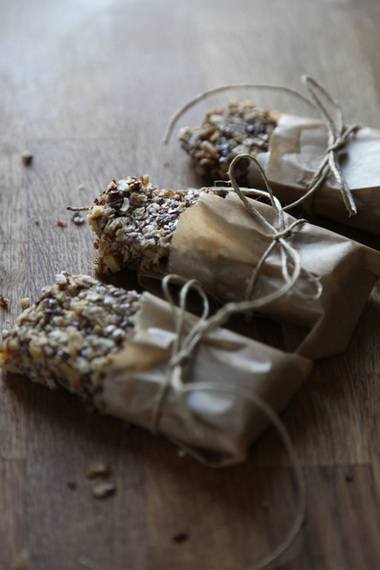 I wrap my granola bars up with a bit of kitchen twine and parchment paper. It gives them both a gourmet and homemade look. They always seems to draw looks of envy when I eat them at the gym. Preheat the oven to 375F. Lightly grease a 7×11 pan and line the bottom with parchment paper, set aside. Spread the oats, flax seeds, and almonds out on a baking tray. Toast the ingredients in the oven for about 8 minutes, or until fragrant and the nuts are golden. Meanwhile, pour the brown sugar, apple juice, honey, oil, vanilla and salt into a large pot and cook over medium heat. Allow the mixture to simmer for about 10 minutes, until thick and syrupy. Remove from the heat and pour the remaining ingredients into the pot and stir to combine. Transfer the mixture to the prepared pan and press it into the pan with a spatula. Work quickly, it will set up fast. Allow the bars to cool for about 20 minutes. While they are still slightly pliable, cut the bars into 12 pieces and wrap tightly. Store the bars at room temperature for up to two weeks.